After the successful launch of Windows 7, now Microsoft is on the way to its launch for Windows 8. This information was leaked by a careless Microsoft developer on his LinkedIn profile and is now removed. Work for the development of Win 8 was started before the completion of Win 7. Windows 8 will be a 128 Bit Compatible OS along with 32 Bit and 64 Bit support, it seems that Win 7 was its last 32 Bit and 64 Bit OS. All are awaiting for the new 128 Bit OS as we have only experienced 64 Bit OS till date. BranchCache is the feature developed in Win 7, basically when the files are accessed from the internet or any file sever they are cached locally so that the next user will be able to access it faster. Major improvement in BrachCache will be seen in Win 8. This is something new we will be seeing in Win 8 servers. This is a replication engine set up for folder synchronization across multiple servers. As per www.window8italia.com the rumors are set that it will be having two different UI, one for 32 Bit and the other for 64 Bit. 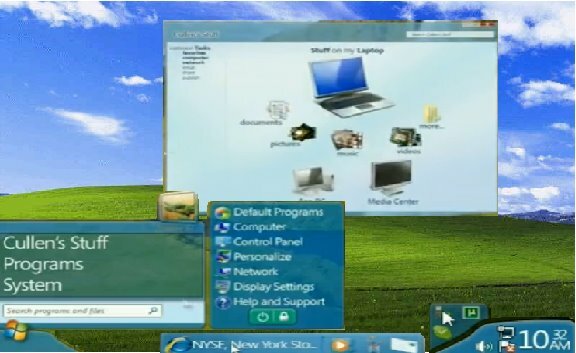 64 Bit Windows 8 Desktop UI will be fully 3D and will be requiring 170 MB of dedicated codenamed “Wind”. The 3D Desktop will be dynamic and adapt users habits. A job post on the Microsoft Career Site states that Windows 8 will be having Online Backup Solutions. They are making it more reliable using the cloud computing and Windows Azure. Another job post in the Microsoft career site states that the security and the authentication in Win 8 will be improved using Strong 2-factor and modern biometrics authentication. The programming and the testing background will also be polished. Win 8 will be more secured making it secure using your Smart Cards, Phone, Biometrics and OTP. Many of you must be aware about the Virtualization in Win 7 i.e. you can boot into Win 7 Enterprise or Ultimate Edition into your copy of Win 7 using Windows VM. This features will also be improved in Win 8, many minimal amount of information is available at present but lets hope for the best from Microsoft where right now compatibility is a Major issue. As per the leaked information there will be a new added feature in Win 8 i.e Dedup. This is a storage reduction features which will deal with the clusters of the drive and the Cloud of Windows Azure. No proper information is available right now, lets hope some thing quite good for cloud users. Apart from all the above things it will be having major changes and upgradation in its Touch Screen support, Battery Identity Management, Biometric Support, etc. Also, it will have a faster boot up and Microsoft will be having and app store for Win 8 to beat the Apple and Android market. The work on Win 8 is in progress and the team is set for its Beta release in early 2011 and it is planned for full release in late 2011 or early 2012. You can view Microsoft Windows 8 System Requirements Online by visiting here. Skype Video Calling On iPhone To Take Over Apple's Facetime ? I agree On hand, which is the best option in the world of the amount . It’s mix together excellent quality with a rate. i Certainly Prescribe this particular ! Does the cloud affect privacy? I jus wanna know how you did that video… i want that OS which you used in the video… or the tranformation pack or what ever…. I want to download windows 8 please send it please provide it quickly plz…………..
let’s see how windows 8 performs. I can’t believe this is all true! I come to know that Windows 8 does not have a start button! Old allegation by Linux user, in you have to go to start button in order to shut down the system, wow! But for me, there is start of end as well.